BY YOUR OWN INCREDIBLE POWER! that stop you from getting what you want in life. combines adaptations of two new and powerful therapy treatments–EMDR (Eye Movement Desensitization and Reprocessing) and BrainspottingTM. Dr. Ranck, a psychotherapist in NYC, who, along with her traditional practice, specializes in creativity and performance enhancement. She witnessed many astonishing and “impossible” while using these fast and effective mind/body techniques and wanted to provide the experience and results in a book for the general public. you just haven’t had easy access to them…until now. 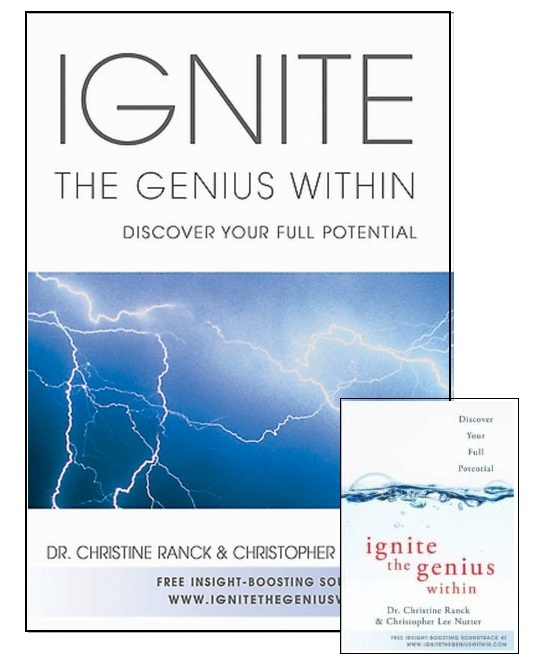 Ignite the Genius Within is a different kind of book altogether. It‘s a book that works from the inside out. Powerful color images and artwork, accompanied by penetrating questions guide you to deep-brain processing. A picture paints a thousand words. Pictures are a short-cut into you. A BILATERAL SOUNDTRACK with music and nature sounds that oscillate back and forth (instead of stereo), stimulates both sides of the brain, distracting the thinking brain, and giving access to dream processing–which usually happens while we’re sleeping. Proven to enhance creativity, this soundtrack allows you to travel through space and time–and sometimes to take a trip into yourself unlike anything you’ve experienced before. By forcing the brain to process information differently, we can begin to see and experience events and ideas differently. A new perspective can potentially change everything. in order to make change happen within the deepest part of you. Buy the book & Get Ignited!